Home Places Europe Greetings from Switzerland! Well the adventure continues… Kim is home safe and sound and I am relieved. Duane and I left Rome and started working our way north. For two days we just blasted up the highways from Rome to Florence and then Florence to Lake Como. The highways here are FAST.. We cruised at 85-90mph and learned real quick what a Mercedes or Audi grill and headlights look like in our mirrors. If we were in the left lane they don’t come up behind you and honk or blink their lights, instead then come up within inches of your real wheel and all of a sudden you look in your mirror and there is this massive car there!! They generally went down the highways at 100 to 120mph so best to stay out of their way. By the time we go to Lake Como it was time to slow down and enjoy the ride. We went out for dinner in a beautiful plaza and had a great meal with of course some wine. I just love Lake Como, it is such a spectacular area. My dream vacation would be to fly into Nice with my wife Bonnie and spend a week there then drive a car to Lake Como and spend a week there.. Someday. 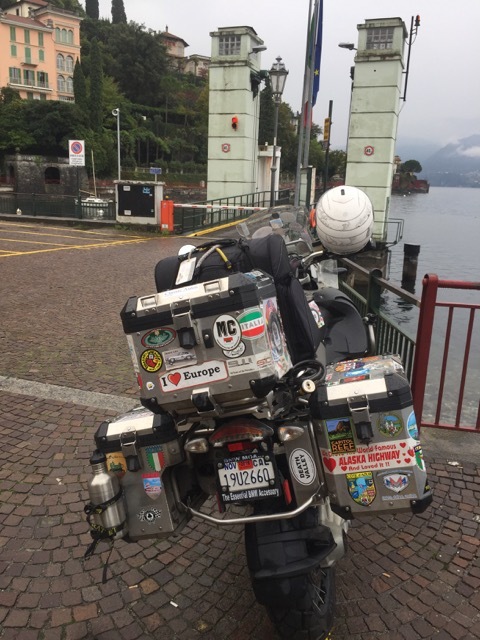 After Lake Como our plan was to ride to Lucerne, Switzerland and meet some friends there at the Ace Cafe.. A great car and motorcycle hang out. There are two ways to get there, an easy two hour ride up the highway or a long 5 hour ride over the Alps. Duane is getting tired and his broken arm is bothering him so he wanted to take the quick easy way. I wanted some adventure so I decided to take the Alpine pass. I got up early and took off. Duane relaxed that morning knowing he would beat me there either way. I set my GPS for what I thought was the Alpine pass but after a few minutes riding I knew something was wrong because it said only two hours to arrival. A reset it again to avoid all highways and tolls and this time it said five hours so I thought I was on the right route. I started riding on a damp,cold, cloudy morning. After about an hour I was out of the city and riding back roads through beautiful mountains and along a beautiful lake. It was a nice ride but the route still didn’t feel right. After a couple of hours something was wrong because I was still not in the Alps. By this time it was really starting to rain and I was beginning to think riding up into the Alps in a storm on a motorcycle might not be one of my best ideas…. So I reset my GPS to fastest route to avoid the mountains. Now I was getting really confused because I had been riding 4 hours and the GPS was taking me down a very narrow road through beautiful Italian villages until I came out to a small village right on a lake and the GPS directed me to a ferry! Something was not right so when all else fails I started asking questions and found a map to look at.. Some how my navigational skills had completely failed me!! After four hours of riding I was still on Lake Como only on the wrong side away from Switzerland!! Wow was I lost… So I took the ferry across the lake which was actually a very relaxing and beautiful trip and got off on the north shore of Lake Como. While waiting for the ferry I met two couples from the USA my age on vacation. 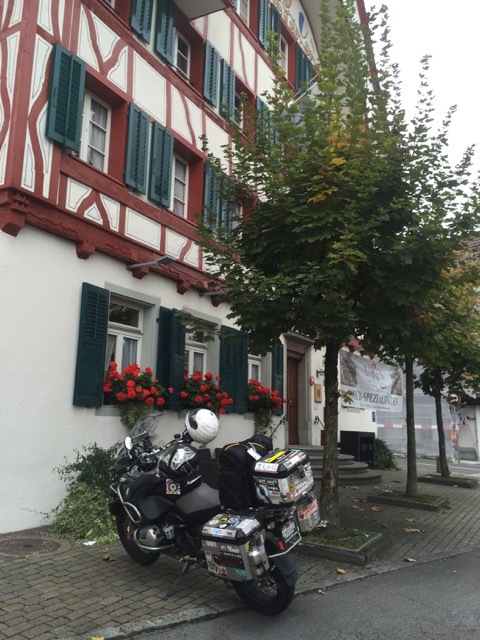 We got to talking and they were very impressed when I told them I was on a motorcycle touring Europe… for nine weeks! 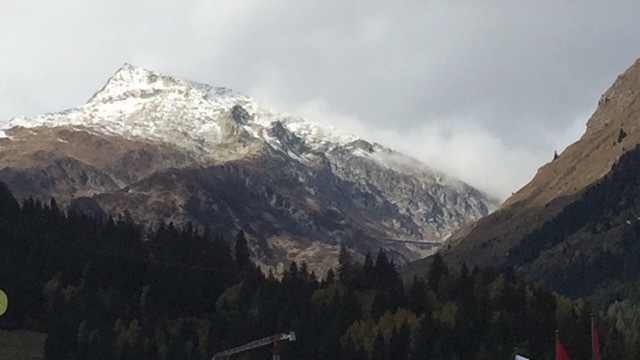 As I crossed the lake on the ferry I could see the Alps all but the tops which were covered in dark ominous clouds… I left the ferry and the very narrow road started a very steep incline zig zagging up the side of the mountains.. Like it or not I was heading into he Alps..!! I had every bit of riding gear on I had, jackets, sweaters, heated jacket, rain pants, rain coat, you name it, I was ready for it. After about 45 minutes I left Italy and officially crossed into Switzerland.. This evening we went out to the Ace Cafe Lucerne to meet our Swiss friend Georg and his son Robin. We have known them for about three years when we met on our last European MC trip. We both share a passion for motorcycles and Jaguars. The Ace Cafe is a restaurant that caters to car and motorcycle enthusiasts. When Duane and I showed up on motorcycles with California license plates we naturally attracted some attention.. We enjoyed a good meal with our friends and made plans to go on a ride together tomorrow.. So while for me it was a VERY long day, it was also very enjoyable and will certainly be one of the more memorable ones of the trip. Another day, another hotel.. It is getting harder and harder to remember where I am! Some views of Lake Como from where we are staying. This villa on Lake Como is where Napoleon stayed when he came here! After a morning of wandering around Lake Como lost I took a ferry ride to where I needed to be to START my ride to Switzerland. Once I left Italy and got to the Swiss side of the mountains the weather and views were great! Our hotel in Lucerne was classic Swiss. Made it to the ACE!! We definitely NEED one of these in San Luis Obispo!! Our Swiss friend Georg and his son Robin. The “Biker Look” is the same the world over.. American culture.. Despite his serious look right here he was actually a very friendly man and gave us the royal treatment once he saw we rode our motorcycle here from California! Next articleA Blog Report just for my Car Friends… or anyone else. Hi, everything is going nicely here and ofcourse every one is sharing information, that’s truly fine, keep up writing. and would love to have you share some stories/information. I know my viewers would value your work. WIFI, just 3G .. Anyways, amazing blog!